Lan Ha Bay is part of the Halong Bay community but unlike its more famous neighbor it boasts some amazing sandy beaches. 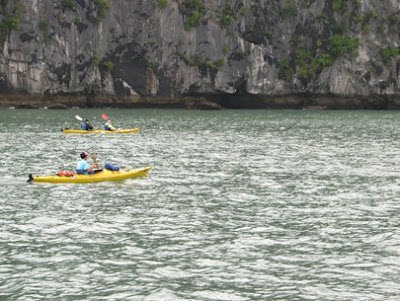 Tourists take a kayak trip in Lan Ha Bay, Cat Ba Island. for its dreamlike and fresh beauty, tourists cannot ignore a pit-stop here when visiting Haiphong Province. Lan Ha has an astonishing 139 sandy beaches. Some of them are tucked between giant rock mounts and thus are more quiet spots without big, crashing waves and are ideal places for a quiet swim. The bay is over 7,000 hectares wide, of which 5,400 hectares is managed by Cat Ba National Park. This is a peaceful bay with 400 islands and islets of varied sizes. The bay is endowed with limestone mountains which give the sea small islands and islets as well as fascinating caves. Some caves have wonderful stalactites in diverse colors and shapes in Ham Rong, Do Cung and Ca grottoes. There are also hundreds of rocks in various shapes such as Guoc Islet (shoe) or Doi Islet (bat). Diving to admire colorful corals is a must in Lan Ha with Van Boi and Van Ha beaches, Sen, Cu and Khi islands as good choices.Tourists can also drift along canyons and small islets by kayak or wooden boats. There are also some pearl farms in Cat Dua Beach to discover. Lan Ha Bay also features a scattering of fishing villages which are also must-see places for travelers to learn more about the daily life, culture and customs of fishermen.